3M Products 08074 - Spray Trim Adhesive 16.8 Oz. 3M Products 08088 - Spray General Trim Adhesive 18.1 Oz. 3M Products 08090 - Spray Super Trim Adhesive 19 Oz. 3M Products 38808 - Headliner And Fabric Adhesive 18 Oz. 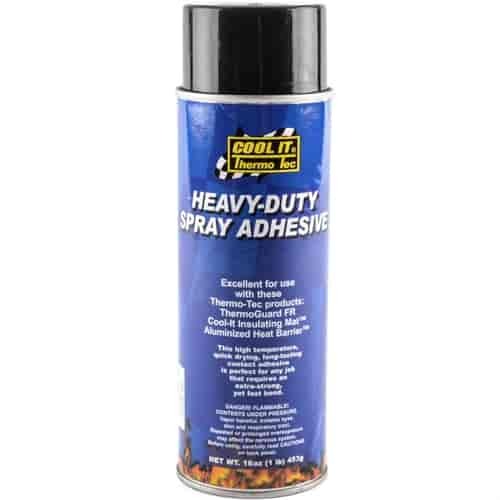 Heavy-Duty Spray Adhesive is a high temperature, quick bonding spray adhesive that is perfect for installing heat shielding, heat mats, and heat blankets or any other application that requires a contact adhesive. Comes in a 16.75oz. can and is perfect for your high temp quick acting adhesive needs. Made in the U.S.A.! 12005 - Thermo-Tec Spray Adhesive is rated 5.0 out of 5 by 4. Rated 5 out of 5 by Quickrick from Great product Excellent adhesive for high temp situations. Super easy to apply. Arrived promptly. Rated 5 out of 5 by Marcia48 from Worked exactly as advertised Bought this product to glue insulation on the inside a rhino engine cowling where the heat is extreme and it kept the heat and sound insulation attached tightly to the cowling even though we put the rhino through rough trails. Rated 5 out of 5 by Vinny Bags from Super Strong Works great used in the engine compartment of my diesel pusher RV held the old and new insulation in place.